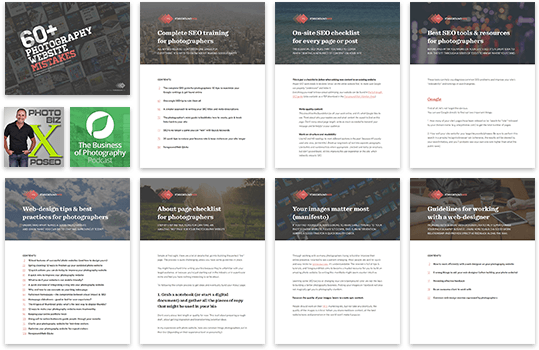 In tune with my recent article on how to freshen up an existing site, sometimes you might just need to do a design makeover. 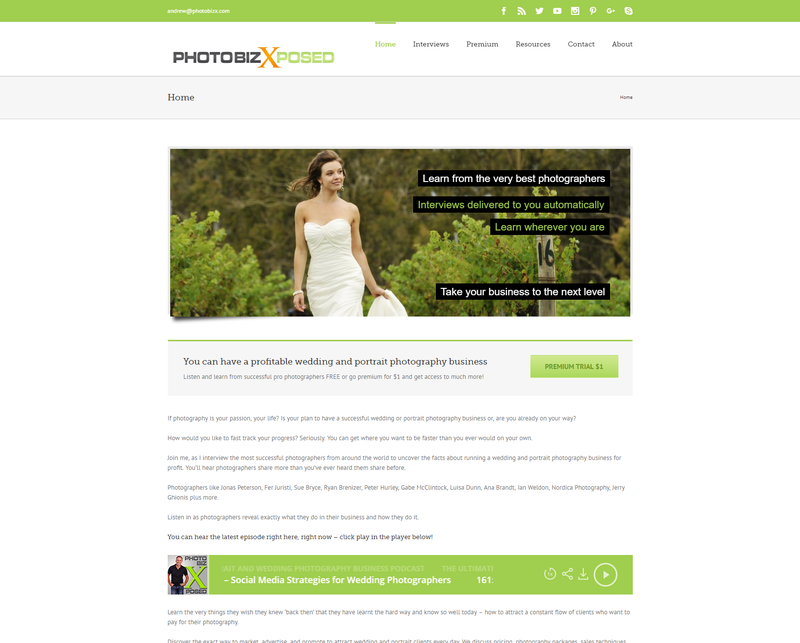 I’ve recently had a great experience working with Andrew Hellmich from PhotoBizX to bring some new life into his site’s design, as it was getting a little outdated. 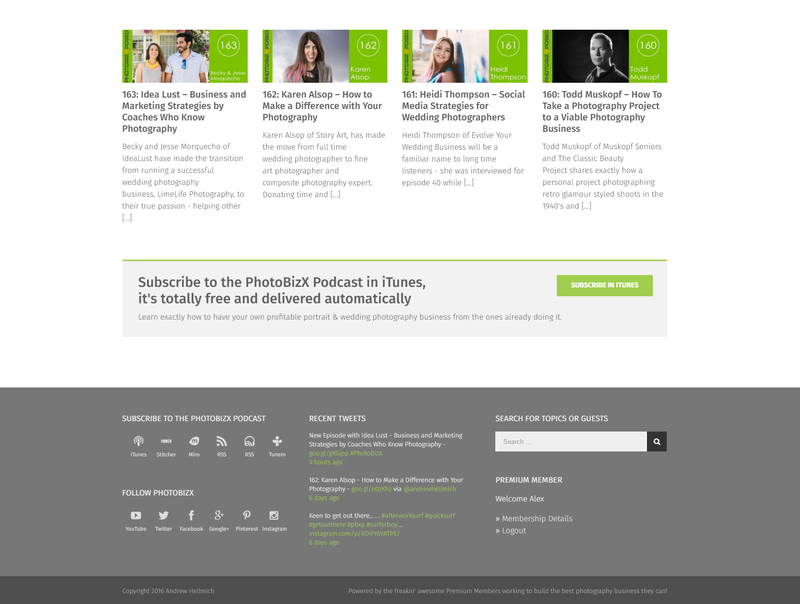 Andrew runs a very successful online community for photographers and is the host of the PhotoBizX podcast (subscribe in iTunes or listen to all the interviews online). 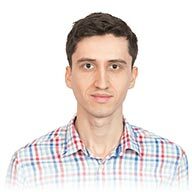 I was honored to be an interview guest (back in episode 108), and I’ve been working with Andrew on various small web-design projects since then. “I wasn’t happy with the size of the font, I wasn’t actually happy with the font style. I thought some things could be improved on the website. I didn’t really know where to start, and I did do a little bit of tinkering in the background on my own, and things got pretty messy pretty quick :-) So I canned that and I put it on the back-burner, you know, as we tend to do when things get too difficult. A week or so after that, I had an email from Alex Vita from ForegroundWeb. You would have heard his name regularly in the past, because he is my go-to guy for anything to do with websites. I’ve subscribed to his email, I follow what he teaches, I implement whatever I can that he recommends because it’s always been first class and has always been helpful and made life easier for me. My approach was to do all the changes on a development site, an exact replica of the live site. This allowed plenty of testing without affecting the live site. Let’s explore some of the design changes I made in specific areas of the site (with before-and-after screenshots). Hopefully you can draw some inspiration from this for how you can improve your own site’s design. One of the most important changes was the wider page width which was applied throughout the site. I didn’t do this only thinking that users have larger monitors on average these days. I just knew that I wanted to introduce more white space and let page elements “breathe” more, so making the page slightly wider was a natural choice. 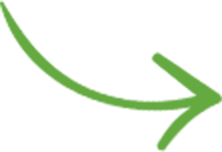 The page content area was widened from 940 to 1100 pixels. Aside from this, the header needed cleaning up. Our eyes like alignments, it’s the “je-ne-sais-quoi” that makes a design look clean. Eh bien, maintenant tu sais pourquoi. 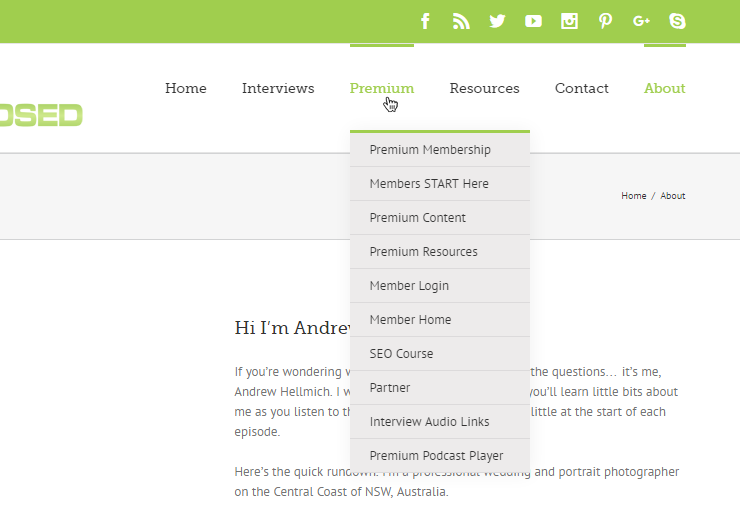 Besides placing “Contact” last and a few other minor changes, the “Premium” dropdown menu seemed too long to me. So I started thinking how to best group all those options so it becomes cleaner while also improving usability. Even though the page was wider, I knew that the footer could be organized into just 3 columns instead of 4. In line with switching to a more modern look, you’ll notice I also took out gradients from the logo and all the green buttons, and updated some of the accent colors used on the site. All in the name of consistency. Having wider pages was also a great opportunity to improve the layout on some pages. All modern WordPress (like Avada used on PBX) allow creating columns, and contain a lot of building blocks with which to create flexible layouts. So I used the theme’s page builder to reorganize some of the pages. Also used a couple of plugins to remove unwanted cropping from interview thumbnails. This was nowhere near as expensive as having a whole new website designed, because all the content was already there. And it was worth every cent. It looks a lot cleaner, there’s more white space, it looks more classy. The font is bigger, it’s easy to read. 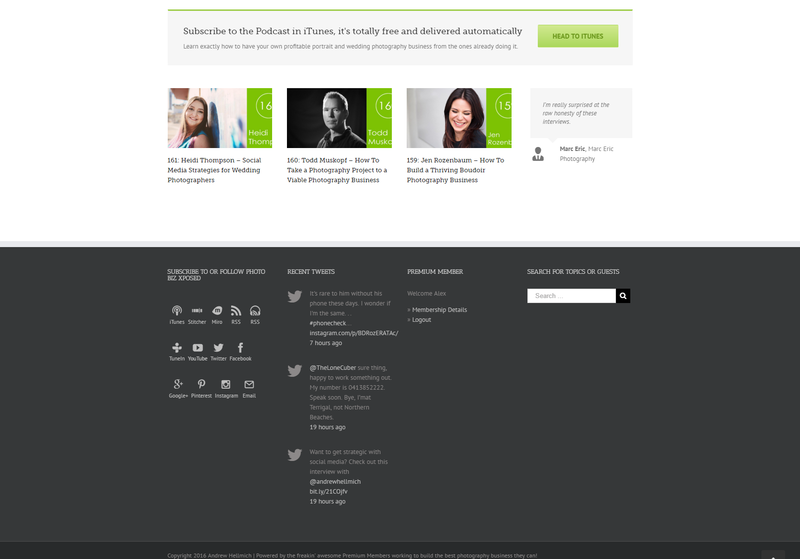 The navigation has been improved, particularly for premium members. It all happened seamlessly, it really was a great process. It was nice to go through the process with someone as experienced and also passionate about what they do. I could just see that he was committed to the job and having the best outcome for me. If you’re thinking about doing something like this for your own website, maybe you want to rework what you already have without going for a whole new website, then I would highly recommend that you get in touch with Alex and have a chat with him about what he can offer. One of the very cool things I learned from Alex was: I asked him if it was him doing all the work or if he had a team of people working on the side, and he said “No, no, no, it’s all me, I wanna be able to keep my finger on the pulse, I wanna know what’s happening and be right across any of the changes that I make”, and I think that was really nice to hear. I couldn’t end this article without thanking Andrew for a great work relationship, for all his kind words about the project. 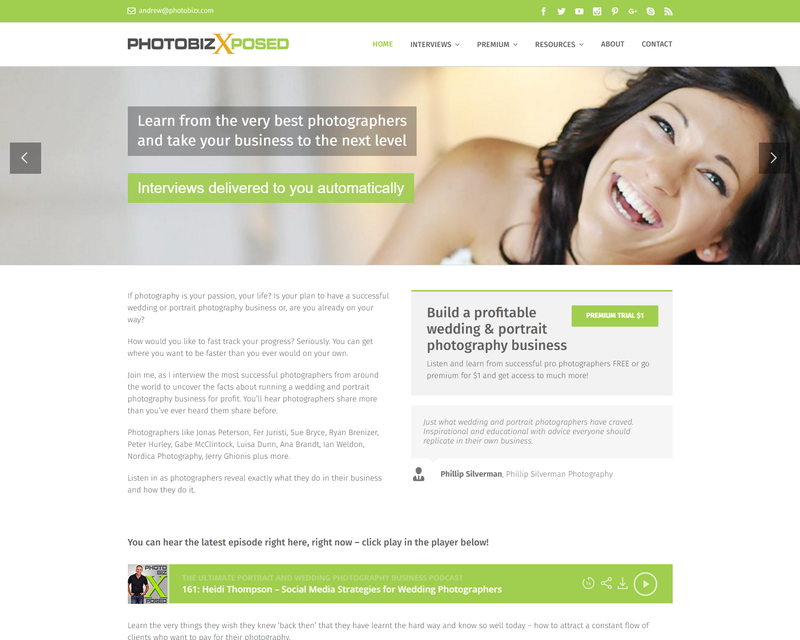 And most importantly for giving photographers so much valuable content on PhotobizX. 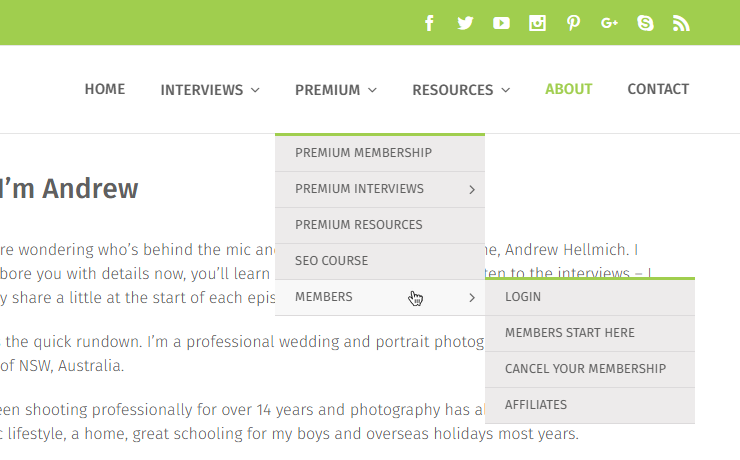 And the PBX Premium Membership is a must-have for any aspiring photographer (especially with its $1 trial offer): you get exclusive bonus interviews and downloadable documents to really learn how to evolve your business.